We frequently hear about the importance of drinking plenty of water, and we couldn’t agree more. Most of us are guilty of not drinking enough, and often we don’t think to drink it or we don’t like it. To determine how much water you need, take your weight and divide by two. That is the number of ounces you need every day. It may seem like a lot, but once you establish the water habit you’ll wonder how you got along without it. Here are a few tips to help you get there. Grab a large glass of water upon waking. We lose about 2% of our water through the night when we sleep, and at 5% dehydration, our brains start to shut down. It’s important to rehydrate and help to support our mental function, and a great way to do it is to start your morning with a tall glass of water. Many of us cannot stand our tap water. You don’t have to suffer with bad-tasting water (that probably has chemicals and minerals you don’t need), and you don’t have to buy it. Bottled water may not be better for you than filtered tap water. Buy a good filter and change it often. You can use a faucet unit, a whole-house filter, or a pitcher filter. Try something fun in your water, such as lemon, lime, or cranberry juice. A little squirt is all you need. Make sure there is no added sugar in your juice, and be sparing, as juice has a lot of sugar. Drink water, not drinks that contain water. 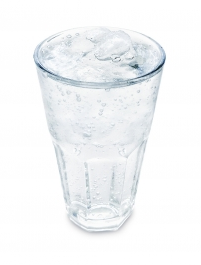 Soda pop, sweet tea, coffee, and Kool-Aid are not what your body needs—water is. This may sound harsh, but it’s time to wean yourself off all of it and drink only water. It’s a process, but your body will love you for it. Drink only one cup of organic coffee in the morning, switch to unsweetened tea, and try seltzer or carbonated water with lemon and lime juice in place of cola or soda. Make it easy to drink water. Keep a bottle or glass next to you at all times so you’ll remember to drink. Take at least 8–10 swallows every time you get up from your desk or your phone rings. Play games with yourself to increase your water intake. However you can get yourself to drink more, do it. Fruits and veggies contain some water, and they count toward your daily needs. So do soups and salads. It’s not a tremendous amount of water, but it does help. Use your imagination to drink more water and flavor it to your liking. The more you drink, the better, and we’d rather see you drinking more water, even if you have to add a little bit of juice to it, than not drinking it at all. Water is a vital part of health. If you’re having trouble getting enough water, call us for a consultation.